For Benicia High School wrestler ﻿Shelly Avelino﻿, the expectation of winning a Sac-Joaquin Section Masters championship will be a regular occurrence. "Coach (Craig) Holden and I were expecting to have two section champions," Benicia wrestling coach Bobby Gonzalez said. "If we didn't, we would have been disappointed, not disappinted in not winning, but that we knew they were the best." history to win a section title and qualify for the CIF Girls State Wrestling Invitational. She won a section title alongside her senior teammate Alyssa Gonzalez, who made it back-to-back titles. She won Times-Herald Athlete of the Week after winning her first match by a 17-2 decision and last two by pinfall to take the 130-pound title. "I'm surprised that I did this," Avelino said. "I've been working hard the whole season and it paid off." The next step for Avelino is a trip to Visalia for the state wrestling meet on Feb. 28. She has an eye toward placing at the tournament. According to TheCaliforniaWrestler.com, Avelino is ranked sixth in the state among 133-pounders. "I expect to place at state," Avelino said. "Even if it's not winning, I expect to place as high as I can." She was nervous heading into her first match against Jackie Verdugo of Atwater. Avelino didn't get the pin, but won by a 20-2 major decision. Avelino got rolling after that pinning Victoria White of Ripon to reach the championship match. Avelino pinned Allyson Sabbagh from Caso Roble High of Orangevale to earn the Masters title. "First match, I wasn't ready, but I got through it," Avelino said. "Second match was really good. Third, I pinned her." Expectations are high for Avelino, who came in as one of the best middle school wrestlers to ever come out of Springstowne Wrestling Academy. She won three state championships from 2011 to 2013 and won a national youth tournament as an eighth-grader. Guiducci said she's the only Springstowne wrestler to qualify for and win the Gene Mills Eastern National Wrestling Tournament in Syracuse, N.Y.
"I expected it," he said. "People that know about wrestling know of her as a freshman." Avelino said that her experience as a youth wrestler did help a little bit, but making the leap to high school was an adjustment. She got her first taste of high school wrestling at the Rebel Rumble tournament in Anaheim. Avelino ended up losing to the No. 1-ranked girl in the state. "I always imagine myself being good in high school," Avelino said. "When I got there I was terrible at first." When it came time for the Masters tournament, Avelino tabbed senior Alyssa Gonzalez for help. Avelino said she got nervous before the finals and Gonzalez told her to think of it as just another match. "Having Alyssa work with her all year has been a huge asset for her," Bobby Gonzalez said. 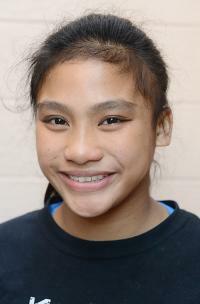 "As long as she keeps working hard and polishing her moves she has a good chance of placing at state." There is a possibility that Avelino could win a state title, but Bobby Gonzalez said other wrestlers would have to make a few mistakes for that to happen. The expectation though is that this won't be the last time she'll get this far. "She could be a four-time section champion," Bobby Gonzalez said. "If she doesn't, it'd be a disappointment for herself and for the coaches." * Justin Abasolo, Benicia boys wrestling, closed out Benicia's run to the Solano County Athletic Conference Championship with a pinfall win over Robert O'Brien. He also won by major decision when the Panthers beat Bella Vista in the Sac-Joaquin Section Team Duals. * Carlos Conerly, North Hills boys basketball, had a pair of good games against Legacy and International. He had a double-double 25 points and 14 rebounds against Legacy and 21 points against International. * Alyssa Gonzalez, Benicia High School wrestling, made it back-to-back section championships after going 3-0 with three pins at the Sac-Joaquin Section Masters tournament. She beat a boy by pinfall during an exhibition match against American Canyon. * ﻿Ricki Liang﻿, Bethel girls wrestling, placed second at the Sac-Joaquin Section Masters tournament to qualify for the state meet. * Zaria Meshack, St. Patrick-St. Vincent girls basketball, showcased all-around floor game last week. She had 16 points, 10 assists and five steals against McKinleyville and a 14 point-five steal performance against Pinole Valley. She also had 16 points against St. Joseph Notre-Dame. * Marc Williams, Bethel High School basketball, finished with a pair of high-scoring games last week. He finished with 19 points against American Canyon and 21 points against Benicia.